Whatever your training requirements, ProTrainings have a solution that will exceed your expectations. With hundreds of instructors around the UK, finding a classroom course couldn't be easier. Or experience the ultimate in flexibility with an online or blended course. Whichever route you pick, you won't regret choosing ProTrainings. 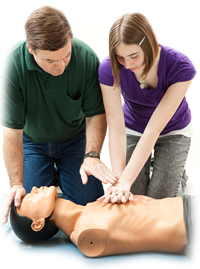 If you're looking to combine the speed and convenience of an online CPR course with a one-on-one experience with a skill evaluator, our blended program is for you. It's a time-efficient solution that's ideal if your job requires a hands-on portion. After training and testing online, simply locate a hands-on skill evaluator to perform your 1-on-1 hands-on evaluation for a small additional fee. Most sessions take under 45 minutes. With hundreds of instructors throughout the UK, finding a skill evaluator for your blended learning is just a click or phone call away. You can search our ProCourses skill evaluator locator or call our customer support department on 01206 805359 and we will help you to find a skill evaluator in your area.